Anne Frank is one of the most famous victims of the Holocaust, thanks to the diary she kept while she lived in hiding in Amsterdam for more than two years during World War II. Her diary, which survived the war and was published by her father in 1947, has sold over 30 million copies (and is on our mother-daughter book club schedule for the spring). Anne Frank: Her Life In Words And Pictures, is a companion piece to Anne Frank: The Diary Of A Young Girl. It provides background on the whole family, much of it provided by her father, as well as photos of the family, the Jewish experience in Amsterdam before and during the war, and the Annex where the Frank family hid before being discovered by the police and sent to concentration camps. Anne Frank: Her Life In Words And Pictures makes the family human and relatable, rather than abstractions. We learn about their personalities, passions and conflicts, and their aspirations before their lives were so cruelly diverted. The book also intersperses commentary from other witnesses – friends of the family, people who worked in the building where the Franks hid, even survivors who knew Anne and her sister in the concentration camps – which extends Anne’s story beyond the day when the family was arrested and she was unable to write in her diary again. Needless to say, this is a painful and difficult book in many ways. I, of course, dreaded the day when the family was removed from the Annex, and the section on the concentration camps is unfathomably awful. But, as always, it is so important to understand and be reminded of what happened to the Jews during World War II, so that we may address the roots of genocide and ensure that it never happens again, to anyone. If only Anne’s life, like the millions of others who perished in the Holocaust, could have turned out differently. What a world we would be living in. 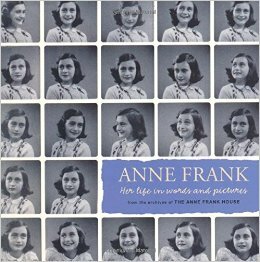 I recommend Anne Frank: Her Life In Words And Pictures to anyone with even a passing interest in Anne Frank and the experience of Jews in the Holocaust. While it’s a good format for young adult readers, with pictures that make it more real than a chapter in a history book or a discussion in a Hebrew school class, it’s also quite upsetting and should be introduced with care and discussed with a parent or teacher.